Apple is looking into claims by a number of AirPods owners that the audio accessories have connectivity issues, with the Bluetooth connection temporarily dropping during phone calls, yet not during music playback. A thread in Apple's Support Communities lists customers who have witnessed the problem, to varying degrees. Some users found the AirPods will drop calls on a frequent basis, ranging from once an hour to every minute, but in the majority of cases, podcast or music played through AirPods works fine with only occasional drops. The problem also appears largely limited to the iPhone 6s and the iPhone 6s Plus, with some also reporting it occurring on the iPhone 7 and iPhone 7 Plus. On the other hand, some users on the support forums note that connectivity issues cleared up when they upgraded to an iPhone 7-family device. A few of the forum posts indicated an Apple Watch was connected to the iPhone when the AirPods, suggesting that may be making the situation worse, but others indicate the problem still occurs when an Apple Watch isn't present. AppleInsider attempted to recreate the issue using AirPods and an iPhone 6s Plus, both with and without an Apple Watch, but failed to get similar results -- but with only one set of AirPods and one iPhone 6s Plus available, this is not a conclusive result. When an assortment of other Bluetooth headphones and speakers were tested with the same iPhone 6s Plus, dropped calls sporadically took place suggesting a possible issue not specifically related to the AirPods. Some support forum users have reported speaking to Apple Engineering over the issue, replicating the problem for staff, and supplying device logs for further investigation. MacRumors noted on Monday that Apple was investigating connectivity problems, but it is not clear if Apple is doing anything more to determine if there is a larger problem with the device, than it normally undertakes on a day-to-day basis. "We always examine service trends to see if there's specific incompatibilities with our products, and we are aware of the complaints from a small proportion of iPhone 6+ owners," a representative from Apple told us. "At this time there's nothing to report." Bluetooth connectivity with audio devices has been a sporadic issue for iOS in the past, with changes to the Bluetooth protocol in a previous iOS update in December 2015 causing problems with some in-car audio systems and hearing aids. In many cases, device owners were able to get firmware updates from the manufacturers that updated the onboard Bluetooth software to bring it in line with current protocols. Other issues were resolved with the iOS 10 update. Connectivity issues were reportedly behind the delays in the AirPods release, with problems keeping audio synchronized between the left and right parts causing a disorienting experience. For Apple's own hardware, the company has created the W1 chip to improve Bluetooth connectivity. The AirPods and more recent Beats wireless headphones use the chip for a simplified pairing process and an improved audio performance, as well as extending the usable range between the accessories and the music source. AirPod-gate! Worse than exploding Sammy Notes because Apple! This is definitely a problem. 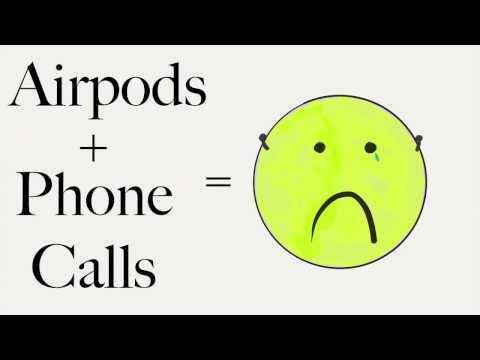 AirPods disconnect from phone calls. One workaround to the phone-disconnect problems seems to be using only ONE AirPod during a phone call. This decreases the disconnects. I'm not badmouthing AirPods; I love the vision and the convenience. But we also need to be honest and transparent about the shortcomings of v1 so that Apple engineers can continue improving them. Right, but have you reported your problem to Apple? I am on my 2nd pair. 1st pair, dropped calls & music (streaming). Dealt with customer service & escalated to engineers. Results, Apple emailed Fedex label, nextday to airpods to apple engineers. And within 2 to 3 weeks, received new pair. It's been 3 weeks, so far so good. I have iphone 6s. AirPods are for people that don't care how dorky they look wearing them. There was a time in my youth when I spotted small kids wearing those special eye glasses I later found out were important to help them correct their vision the way braces can help straighten you teeth and improve your bite. I can't get past that impression when seeing images of people (never seen a live person with them on) wearing AirPods. If a young male or female model perfectly lit, styled and photographed looks foolish how will the rest of us fair in the real world. Apple you dropped the cool ball on this one, big. This has nothing to do with Airpods. I have the exact same issue with both Airpods and Beats Solo 3. Both of them disconnect from calls, music, whatever they're playing. Usually a couple times an hour. Then reconnect after 10 seconds or so. Amazing how these issues go unreported for months despite that they're obviously very widespread. Yes. I visited the Genius Bar of my local Apple Store (Virginia). They agreed to give me a replacement set of AirPods when they get more in-stock. I predict the new set of AirPods will have identical problems, but replacing them is a necessary step to eliminate the possibility of a manufacturing problem with my specific set. I have experienced the same issues (6S + apple watch + apple battery case). I do enjoy my AirPods but the blips during playback are kind of annoying, but the drops during business calls are REALLY annoying. I also notice that there's a delay in connecting (or sometimes doesn't connect at all) when I have snap chat open and i pop an AirPod in my ear. Still like the overall product but hopefully they can iron out these issues. Actually, that's complete BS. What they look like is -- EarPods without wires. I wear them every day at the gym, and the only comments I've gotten are curiosity and mild wonder "Oh, cool..." usually followed by "Do those only work on the new iPhone?" You're likely not seeing many of them because they're extremely supply constrained for reasons we'll likely never know. Just like the Watch, when they mass production has kicked into high gear you'll see them all over the place. I see the Watch on randoms every single day. "Dropped the ball" LOL. There's a reason they continue to sell as fast as Apple can make them. You apparently would be self-conscious about wearing them, but tens of millions of people have apparently decided that you "look like a dork" whether you are wearing Beats or Bose cans, Bragi plugs or the regular Earbuds. It's just what people get used to. Folks are used to seeing other people with cords hanging out of their ears, can's stuck on the heads, etc. When the Earbuds came out, people laughed at the bright white things hanging out of your ears with long bright white cords dangling from your ears and now from their initial ads and ubiquity, they are seen as normal, even hip to many. Apple is adding the W-1 to its Beats line and will undoubtedly add different models, colors, etc., but when they are selling tens of millions of them, it sounds silly to say that the Airpods are a big miss. BTW, Apple is now the largest seller of wireless headphones in the world, and has 60% of the world wide market for premium headphones. I pre-ordered mine when they first came out (so first shipment) and I haven't had hardly any issues with my iPhone 7 and  Watch (1st gen). There is the very rare drop and then reconnect (both with music and on voice calls), but it is far superior to any other bluetooth headphone I have tried. Yes, I get the odd stare but once I explain what they are folks are intrigued and usually ask me lots of questions. I find they also work well on airplanes (I usually use a Bose QC15, but I'm pleased with using AirPods). I'm sure everyone on this forum knows this, but when all else fails always power down and then power up all of the connected devices as a first step to any problem. Have you seen a dead person using AirPods? No problems with mine. Love them. One of the best products ever. I use them with a 6S. No dropped calls. Very rare dyschrony between channels or channel dropping especially when I first put them on but it self-resolves wonderfully. Best bluetooth product ever. It is making me want to get an Apple Watch so I can control the volume without Siri or taking my phone out of my pocket. I experienced the same issues with my 6s Plus, they were pretty much unusable on phone calls. Updated to 10.3 beta and issue was resolved instantly. I'm now loving them! I feel like they are honestly the perfect companion to my Apple Watch as I use it to adjust volume and skip songs instead of using Siri option. Hopefully issue will be resolved for everyone soon. The Apple Forum page is now 37 pages long, but with many people finding that the more Bluetooth devices you have active, the more likely this issue is to occur. Once dead certain way of replicating this issue is if you're running the app "Tile", which maintains a Bluetooth connection to each and every Tile you own. I have 6 tiles, so that's 6 active Bluetooth connections, vying for priority against my AirPods (with a much stronger signal, as I can detect a Tile from 50 metres). Fortunately, in the Tile app, you can go into settings (via the small cog icon) and turn off Bluetooth. Obviously this renders the app completely redundant, but you should then find the phone audio magically reappears (unless you've got a bunch of other Bluetooth devices simultaneously connected). I don't really understand why the non-audio Tile devices interfere with AirPods... can iOS prioritize devices? Could the tile app relinquish connections and only activate them periodically?